Aubrey Plaza wears grey low top Converse All Star “Chuck Taylor” sneakers in the series. Amy Poehler wears black and white low top Converse All Star “Chuck Taylor” sneakers in the series. 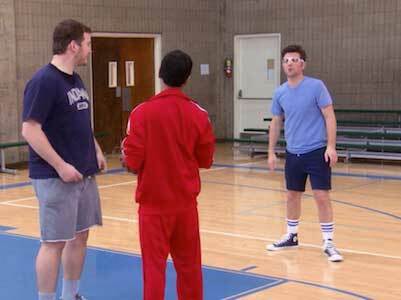 Adam Scott wears black high top Converse All Star “Chuck Taylor” sneakers in the series. Leslie and Ron pass time in the Parks Department. Who knew the bureaucratic work of small town government would be the perfect place to mine for comedy gold. NBC’s Parks and Recreation is a mockumentary-style political sitcom set in the fictional town of Pawnee, Indiana. Shot in a very similar style to NBC’s other hit workplace sitcom, The Office, the show was created by Greg Daniels and Michael Schur, who are known for their work on shows like Brooklyn Nine-Nine, Saturday Night Live, The Simpsons, King of the Hill, and The Good Place. The show features an ensemble cast of Amy Poehler, Rashida Jones, Aziz Ansari, Nick Offerman, Aubrey Plaza, Chris Pratt, Adam Scott, Rob Lowe, Jim O'Heir, Retta as Donna Meagle, and Billy Eichner. The show lasted for seven seasons, and, while never a ratings juggernaut, was well received and beloved by critics and fans. Tom seeks advice from April regarding his love life. The show is centered around the life and career of Leslie Knope (Poehler), the Deputy Director of the Parks and Recreation Department of Pawnee, Indiana. Leslie is an extremely cheerful, ambitious, and hard-working civil servant, who is always optimistic in her belief that government should always service the people. She regularly goes way above and beyond for the people of Pawnee, and her actions almost always clash with her superior Ron Swanson (Offerman), a staunch libertarian who feels all government should be abolished, and who only works in government to make sure nothing gets done. The show also follows the lives of Leslie’s coworkers and friends including her best friend Ann Perkins (Jones), her assistant Tom Haverford (Ansari), state auditor Ben Wyatt (Scott), city manager Chris Traeger (Lowe), intern April Ludgate (Plaza), shoe shine boy Andy Dwyer (Pratt), office manager Donna Meagle (Retta), and the lovable office punching bag, Jerry/Larry/Terry/Gary Gergich (O’Heir). Ben wears chucks while teaching Tom how to play basketball. This group of friends/coworkers spend the vast majority of their time in the office of the Pawnee Parks and Recreation Department. It’s here that they (mostly Leslie) work diligently to make Pawnee the best it can be. There are major goals and events for the majority of the seasons such as bringing back the Pawnee Harvest festival, building the Pawnee Commons, and Leslie’s campaign for City Council. Along the way, the gang may solve a smaller problem or two, and usually have to deal with the unruly citizens they serve. These people of Pawnee are often scene stealers due to their insane requests, demands, and personalities. Leslie tries her best to satisfy them, but often it seems that no matter what she does, the people of Pawnee will never be satisfied. However, she is always hopeful and optimistic about her town’s future, and she never ever gives up much to the chagrin of her adversaries. It’s this drive and never say die attitude that make Leslie such an easy character to root for. Leslie wearing chucks after she adopts every animal at the animal shelter, including this pig. One of the show’s most memorable qualities, and main reason why it has become such a cult favorite is its running gags and bits that covered multiple seasons, and for the classic quotes. Some great examples are Leslie’s love for waffles, Ann and Leslie’s over the top friendship, Li’l Sebastian, the Pawnee raccoon problem, Mouse Rat, and basically anything Ron ever says. Some great episodes to check out include “Ron & Tammy: Part 2”, “Li’l Sebastian”, “Leslie And Ron”, “Pawnee Rangers“, “The Johnny Karate Super Awesome Musical Explosion Show”, and “One Last Ride”. To be honest though, the majority of Parks and Recreation is comedy gold, and you’d be hard pressed to find a bad episode. April sprays Andy with a hose while wearing gray chuck. Parks and Recreation is remembered fondly for its amazingly quotable lines, and great comedy, but what truly made it stand out above other sitcoms of the time was it’s fantastic character growth and development. All the characters on this show changed dramatically over its seven season run, but those changes never felt forced or out of place. The way Ben changed from cold and calculating state auditor to a lovable dork of a husband felt like a real life unraveling of events. This same applies to other characters like Leslie, Ron, Tom, and April. Each of their lives feel like that of a real person, and that level of authenticity gave the show genuine emotional moments on top of its stellar comedy and classic running gags.